Wondering What Size Desk to Buy? We carry many desk sizes, even custom size desk and credenza — visit our showroom for complete selection and available options! How Many Desks Will Fit in One Room? No need to guess! Work with any of our experienced space planners and know exactly what can work for you! When your office furniture arrives, all you need to do is LOVE it! We take the worry out, because we plan it all out for you before you even buy it. Visit our Call to Order Online, Today! And get the office ready for prime time. Seems the street numbering here in Long Island can be a trip for even a smart GPS — the numbers recycle here on E Jericho Turnpike — fear not, here's your guide to finding BiNA Office Furniture discounts! We can be found most readily between Glen Cove Road and Roslyn Road on EAST Jericho Turnpike, just a chair's throw from the Meadowbrook Parkway or a conference table hurl away from the Long Island Expressway and Northern State Parkway. Our cross street is Barwick Boulevard, which is a traffic light stop on E Jericho Turnpike, 1/2 a mile west of Glen Cove Road, or east of Roslyn Road. Those in the know know where to go! 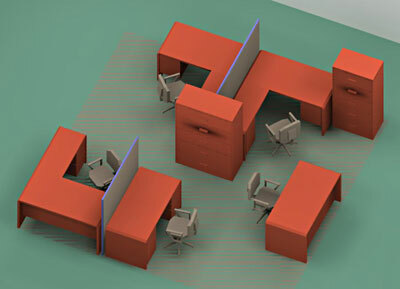 It's easy to find the best values in office furniture here in New York - BiNA Office Furniture in Mineola-Garden City, Long Island has been a local favorite for decades to come and why not come here and find out for yourself what makes us the dependable and reliable source for quality desks, cubicles, conference tables and more. We've got something for every office, including your home office too, and for everyone seeking long-lasting values in quality office furniture that will keep your office running so you can get back to work and keep yourself in motion. There's an old adage, "buy it cheap — buy it twice"
... we don't know whether to laugh or cry when visitors think they are comparing our quality with chain store junk. There is no comparison, only contrast: Our staff are office furniture experts with decades of product and application know-how to make your office better, smarter, sharper and budget-wise. Our products are seasoned quality items we've hand picked from our manufacturers to provide durability and excellence in workday use. After all, a chair is for sitting in, not just a picture on a page. And a desk is for working, along with all the file cabinets, hutches, bookcases and complements. We've got them all here, so come in and save your dollars by buying smart the first time. Call us now: 516-248-5858 and save!